Is it ok for my dog to swim in the pool? Q: Is it ok for my dog to swim in the pool, or drink the pool water? 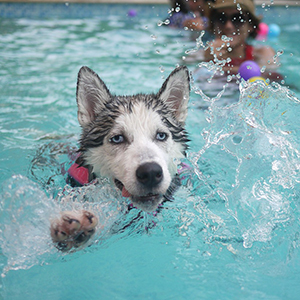 Dogs love to swim in the swimming pools. However, chlorinated water is not good for dogs. The chlorine can remove the natural oils from the dog’s body and cause dry, itchy skin. Also, too high of a sanitizer level can irritate the dog’s esophagus if they drink the pool water.